At this years National Manufacturing Week, a new family of locally assembled gear units was unveiled by Australia’s premier drives solutions provider, SEW-Eurodrive. Featuring an extended bearing distance (EBD), the EBD MC Compact series of helical and helical-bevel gear units has been engineered to absorb the high bending moments and axial forces that occur in mixer and agitator applications. Like SEW-Eurodrive’s popular MC Compact series, the EBD MC Compact range is fully assembled in Australia, ensuring SEW-Eurodrive can provide uniquely fast turnaround on complete gear-unit packages. The EBD concept follows SEW-Eurodrive’s established philosophy of keeping things simple and modular: it consists purely of add-on components, such as stronger bearings, a larger diameter output shaft, and an extended bottom bearing housing. “We’ve designed these units to handle anything that moves large quantities, whether they are for agitators, mixers, aerators or thickeners,” said Tribe. Because of the potential contamination of the agitated medium by bearing lubricants, SEW-Eurodrive can also incorporate a ‘drywell’ sealing system to prevent oil leakage at the output shaft in vertical mounting positions. The Australian-assembled EBD MC Compact series is available now in various mounting arrangements and configuration options, and offered in five sizes, with torque ratings of 16 to 48kNm, suitable for motor powers up to 250 kW. To explore SEW-Eurodrive’s EBD MC Compact gear unit series, visit SEW-Eurodrive at National Manufacturing Week 2009: Melbourne Convention and Exhibition Centre, Southbank, 12 to 15 May, 2009. 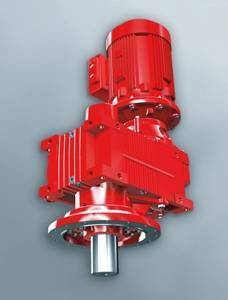 The SEW-Eurodrive EBD MC Compact series gear units are capable of absorbing the high axial forces that occur in agitator applications. The Australian division of SEW-Eurodrive is headquartered in Melbourne and is supported by a network of offices in Sydney, Brisbane, Townsville, Adelaide and Perth. A comprehensive service and technical support centre is located in Melbourne, and complemented by assembly facilities in both Melbourne and Sydney. The company’s customer base includes large-scale corporations and smaller entrepreneurial enterprises across Australia.